Nim: “I don’t go to school. 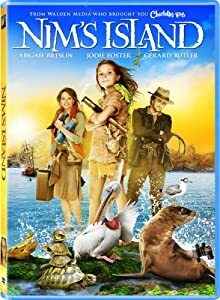 You see I’m homeschooled………….well actually island schooled”………..
Synopsis: Anything can happen on Nims Island, a magical place ruled by a young girls imagination. It is an existence that mirrors that of her favorite literary character, Alex Rover- the worlds greatest adventurer. But Alexandra, the author of the Rover books, leads a reclusive life in the big city. When Nims father goes missing from their island, a twist of fate brings her together with Alexandra. Now, they must draw courage from their fictional hero, Alex Rover, and find strength in one another to conquer Nims Island. Dove Worldview: This is a film that is clever and thrilling! Alex Rover is the worlds greatest adventurer in books, but the author Alexandra Rover is another matter entirely. She suffers from agoraphobia, and is called upon to leave her safe haven at home to help a young girl stranded alone on an island. The adventures soon kick in and this is where the fun really begins. In contrast, we see Alexandra hanging on for dear life as she travels across the world in search of Nim where she endures more than one close call. Abigail Breslin turns in a fine performance as young Nim, and Jodi Foster has some very funny moments including a scene when a spider appears on her computer. Gerard Butler is good too in his double role as both Nims dad and the fictional character Alex Rover. While the movie has some intense moments, it is a wholesome film and we happily award it our Dove “Family-Approved” Seal (Recommended for ages 12 and over). We suggest you get stranded on “Nims Island” at your local theater. It is an imaginative adventure all the way! Read more of the review via Nims Island Review by The Dove Foundation.